Qatar is looking to invest in yet another airline, according to CEO speaking at the Aviation Africa Summit. The Middle Eastern carrier already has stakes in many other airlines, including British Airways and Air Italy. This news comes as a surprise, since Qatar is currently wrestling with its own membership of the One World alliance, not to mention its year on year losses. As first reported by Air Transport World, it seems that Qatar is keen to acquire a stake in a new airline this year. The airline in question has not been previously discussed by Qatar but will not be revealed at this stage, according to Qatar CEO Akbar Al Baker at the Aviation Africa Summit. Qatar Airways will add even more destinations to its already extensive route network. Photo: Wikipedia. Previously the Qatar Airlines CEO discussed investing in an Indian airline. With a massive population reach and a strong (although price sensitive) domestic market, they saw an opportunity here. However, this new airline acquisition plan is not believed to involve an Indian carrier. If we were to hazard a guess as to which airline they want to invest in, we would suggest a North American carrier. Qatar has been looking for a way into the American market for quite some time, and by becoming a major shareholder of one of the big three (American, United, Delta), they could just do that. If Qatar were to invest in another American airline, then it is likely they would have to leave Oneworld. American Airlines would not allow a partner to operate with a competitor. How is Qatar able to afford this? It’s the million dollar question. Last year, Qatar made a loss operating its own airline. 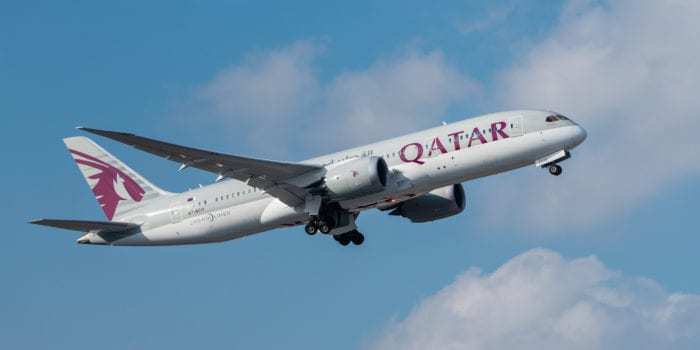 This was due to their expansion, investments in other airlines and the (still in force) blockade preventing Qatar planes from flying outside a narrow strip of sea in the Gulf. “We announced a loss last year and we will announce another loss this year but it doesn’t mean that Qatar Airways is not going to expand or invest. In addition to acquiring a stake in a new airline, Qatar plans to launch seven new routes in early 2019, with another seven in the latter half of the year. Which airline do you think Qatar should invest in? Let us know in the comments. i think they are looking for Ethiopian airlines, its serve their goal in Africa or Moroccan airlines they mention before might interested in it . They will lose money investing in Malaysia Airlines.